Following on from Matt's excellent two-part season one review was always going to be a challenge. But I'm willing to step up to the plate and look at the following year of episodes stretching from The 37's to Basics, Part I. Now please note how we've split this - in US airing order - which means we'll be covering the four episodes produced at the end of season one and cutting off before we get into the second part of Basics. Back in the 90's I panned this series to all who would listen. I was negative about the show, compared every frame to Deep Space Nine which was already into its fourth year and generally didn't like it. How times have changed. I avoided Voyager like the plague for years, rarely watching an episode and consciously skirting the first couple of seasons. Now I feel like a bit of an idiot because while there is a bit to scorn there is also a whole trolley load of great things to say. The year kicks off with what was intended as the first season closer, The 37's. Honestly the whole cargo bay scene works better as a season finale however the landing sequence does give the show a big stunt to start the season. Whenever I see The 37's I'm reminded of blue alert on Red Dwarf which required the changing of the bulb in the red alert sign (for reference that's in series six's Legion). I adore The 37's for the concept of humans snatched from Earth and used as slaves by another race. This episode is one of my guilty pleasure stories as even though the trope has been used a lot in sci-fi. I don't think this episode takes it too seriously, rather a more indulgent route with an old truck, an old plane and Amelia Earhart all packed in as well as that all-important ship landing. At least they would get more mileage out of this stock footage than they did out of the saucer separation sequence in The Next Generation. Those withheld episodes from season one are mixed into the first quarter of the season and are a jumble of good, bad and average themselves. I know The 37's isn't a popular ep but Projections which saw the Doctor highlighted and a guest slot from Dwight Schultz as bumbling engineer Barclay was four acts of brilliance with the is-he-isn't-he confusion that made stories such as Frame of Mind so damn amazing. 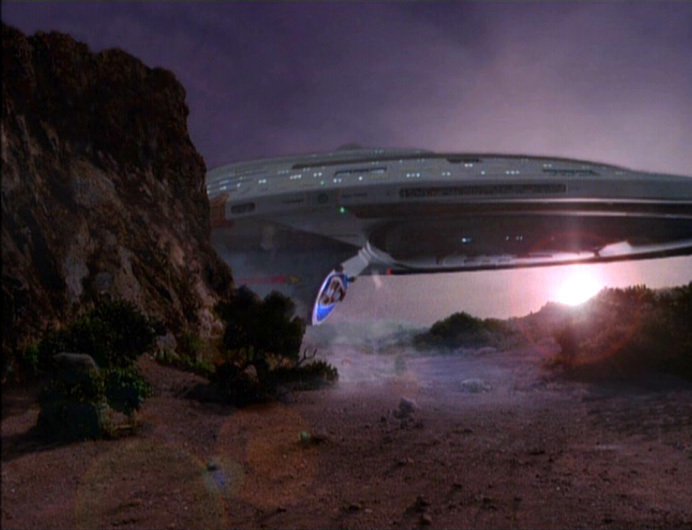 One episode that certainly showed Voyager's potential early on as well as its flair for more conceptual storylines. Twisted and Elogium are easily the weakest of the four with the former actually ending with the crew doing...nothing. If only they'd considered this at the beginning we might have been saved fro a below par episode. Sexed-up Kes in Elogium doesn't really work either especially when you remind yourself she's about 1 year old and Neelix may seem to be verging on an aging pimp. Slightly uncomfortable when you watch it back and not one I'll be dropping back to quickly. The first "new" episode comes in Initiations where Nog from Deep Space Nine plays a Kazon and Chakotay gets a decent amount of screen-time but no decent character development leaving Robert Beltran to walk through the episode in rote. A shame because it's fairly compelling as a story however the Kazon still don't come across as enough of a threat. 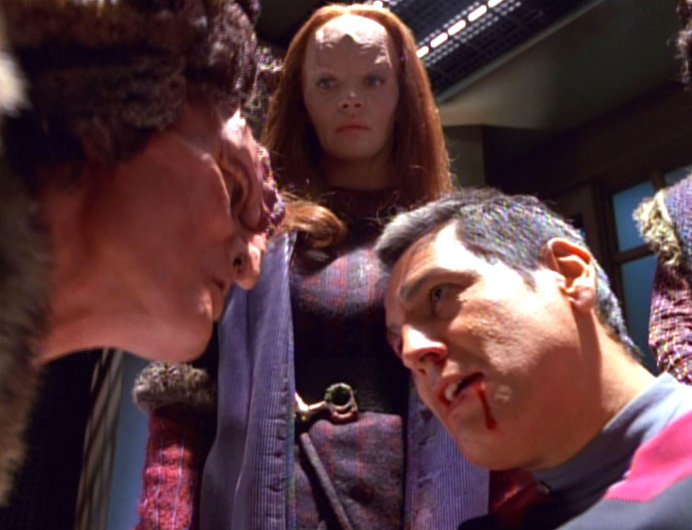 Chakotay has a couple of good stories this season including this and the later Tattoo as well as his exile with Janeway in Resolutions. That one's a hidden gem of the season going totally against expectations and definitely trying something different by removing the most senior officers and exploring a what-could-have-been story which is a trend Voyager managed to do several times and very successfully. 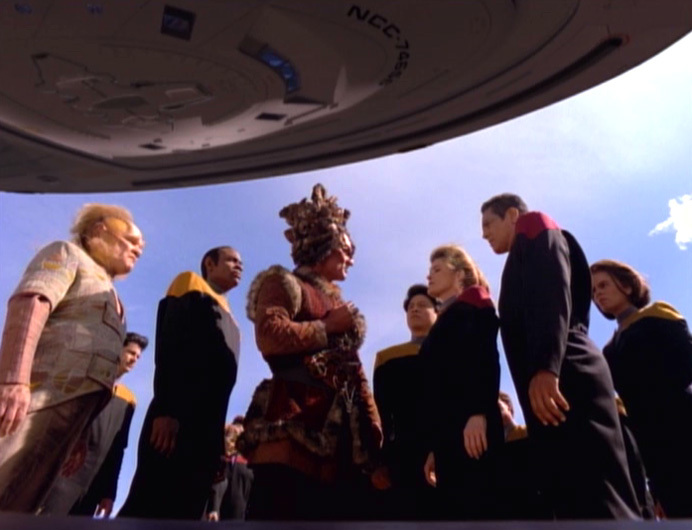 Speaking of the Kazon, season two plays out their story to the end(ish). Maneuvers, Alliances and Investigations keep the crew in touch with the Kazon Nistrum and Seska, leading to an almost truce but there's always the desire to capture Voyager. Crewman Jonas' deceit lies through most of the year and reminds us all of what could have been if the Maquis hadn't been neutered in season one. That wanton desire to capture Voyager and become the most powerful sect is just where the year plays out in the opening half of Basics. A brilliant two-parter fully filmed within season two, it's conclusion wherein the crew are marooned does mirror the end of Deep Space Nine's fifth year loss of the station. The crew's preparations against the imminent attack are great to see and their implementation even suggests that they might succeed however there's always a twist - or a Kazon - that can ruin everything. As well as this we get Lan Suder's second appearance after Meld. Brad Dourif's Maquis killer is one of Voyager's greatest secondary characters robbed of a bigger story but ever the more memorable. 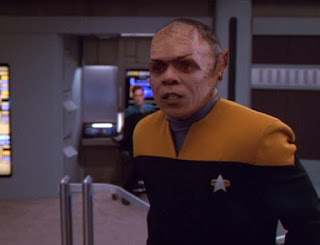 His pairing with Tim Russ in that earlier episode was truly mesmerising as we explored his psyche with a character you would never expect to see within the Star Trek franchise, even moreso being a Betazoid. We have to actually return to Earth and add a dash of Runabout for something verging on interesting with Non Sequitur. Jennifer Biel who was last seen as the half Romulan half-Klingon girl in Birthright, Part II returns as Harry's girlfriend Libby as another spacey thing plays its hand. This time Ensign Kim flips into an alternate universe where he never went on Voyager and promptly spends the rest of the story trying to get back there. Harry Kim seems to be Voyager's answer to Miles O'Brien in season two as not only does he get teased with a life back home but dies in Deadlock and gets trapped with a psychotic clown in The Thaw. Not a bad start but you can see how little he's utilised this year in comparison to the rest of the crew. Fortunately it would get better but not for a while. Deadlock in itself though is a brilliant story with a great and truly Voyager size twist as Janeway blows the ship up, all hell breaks loose and we don't quite get the clean reset we might have expected by the credits. PS there are now two Harry Kim's in this universe and one of them is dead. 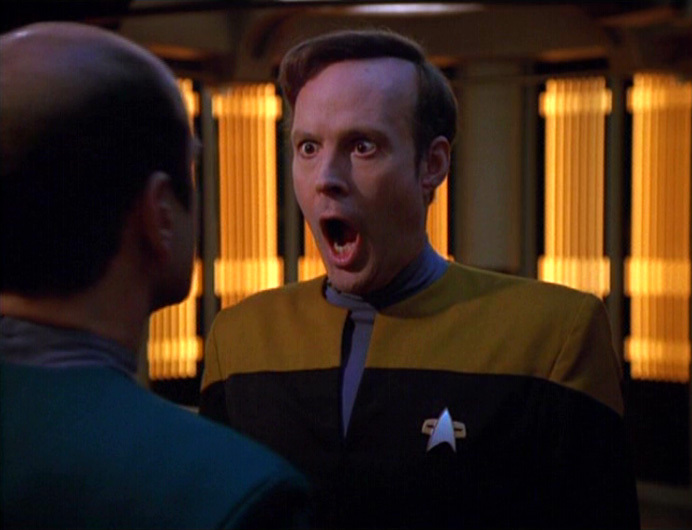 Non Sequitur also showed us what could have happened to Tim Paris had Harry not made it to Deep Space Nine. 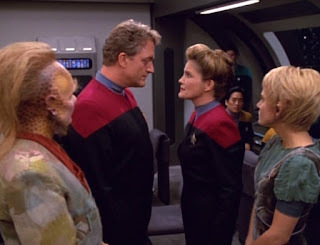 Had he not set foot on Voyager then the "conflict" between the conn officer and Neelix over Kes would have been one aspect we might have avoided and in turn the episode, Parturition. Doing one of the classic pair-two-characters-alone-on-a-planet scenario before adding in an alien baby and you do get a story a little different which does explore the pair even if they come off as spoiled kids. My dislike for Neelix in these early years only increases when Tuvix drops into the season. I know people for some inexplicable reason actually like this one but I have to add it into my bargain bin along with Once Upon a Time, Threshold and The Cloud. It's way too schmaltzy, you know it'll all be fine in the end and even the moral dilemma is weak. Although was getting Neelix back really worth it....? Yes because he's a lot stronger in seasons four through seven and nowhere near as rubbish. Tuvok certainly fares better as a character in season two even if his other major episode of the year places him in the company of three child actors for the duration (Innocence). That story does twist out nicely the first time you see it but on repeated viewings it loses more than a little something as the conversations aren't up to much. What of B'Elanna and the Doctor though? Everyone else has had a mention. Yes, they were around but it's odd to think that while the latter was present he was much more of a supporting role at this stage than a major player as he did become after the acquisition of the mobile emitter in Future's End. The Doctor does surface for Lifesigns as he searches for a way to save the life of a Vidiian scientist (who would pop back up briefly for Basics) and ends up with a romantic affiliation which left me wondering how Voyager could manage to live with using this much power to fuel two sentient holograms continuously. The true gem of the year though has to be Death Wish. It is without question the best 45 minutes of season two and that's more down to the inclusion of John de Lancie and Gerrit Graham as the two opposing Q. This is, personally, my favourite Q episode ever ahead of All Good Things, Tapestry and even Q Who. This is so well scripted, acted and packs a hefty final act with more than one surprise. Tragically it means we get The Q and the Grey and Q2, both of which are substandard and ruined Q forever. But to wrap up here, it's the year that brought us to the edge of Kazon space and opened and closed with USS Voyager parked up on a planet; something we would next see in Dragon's Teeth from season six. Voyager chose not to explore lengthy arcs which fitted with the journey home that would move them logically from territory to territory fairly quickly. 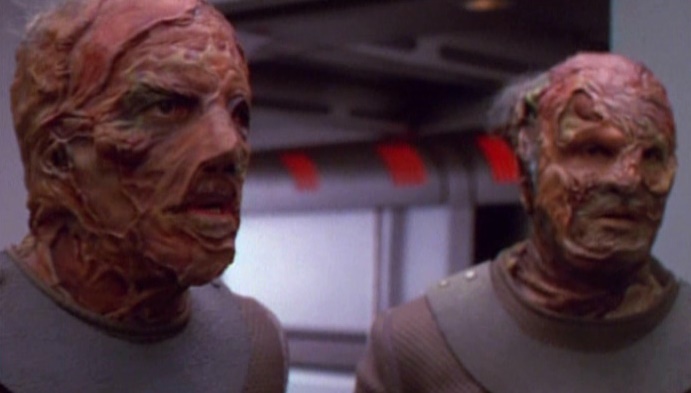 While the Kazon themselves were not the most welcomed of nemeses in the show the run of stories focusing on them were some of the best of the year with a brilliant conclusion that is suggested through the year. Voyager is certainly surprising me as I'm rewatching. Year two is stronger than the first as well it should be but there are so many good moments, episodes and lines that I have forgotten over time. Knowing what the third year has in store I suspect that I'll be even more impressed. After all these years I think I finally understand what made Voyager tick and what made it such a great show. What was hit, what were the misses from season two of Voyager? Final Frontier: Remember the Mag? What Would You Choose With Uncertain Logic?